Effective 15th August, 2017, BSNL customers roaming within in India (but only on BSNL network) would be able to make Outgoing calls as per the tariffs in Home circle and in case a user has activated some special pack, he would be charged as per the rates in Home circle only. For instance, if you have recharged BSNL 395 Plan (Nehle Pe Dehla) on our BSNL number, you would be able to use 3000 min BSNL to BSNL Local & STD calls and 1800 min for Local & STD calls on other networks along with 2GB data per day for 60 days in Roaming as well. Please note you would be able to make calls without any additional charges only if you are on BSNL network. If you are on MTNL network in Mumbai or Delhi, standard roaming rates would apply. Also you have to pay nothing to use these packs in Roaming, there is no recharge to activate this, you will automatically get these benefits from 15th August, 2017 only. 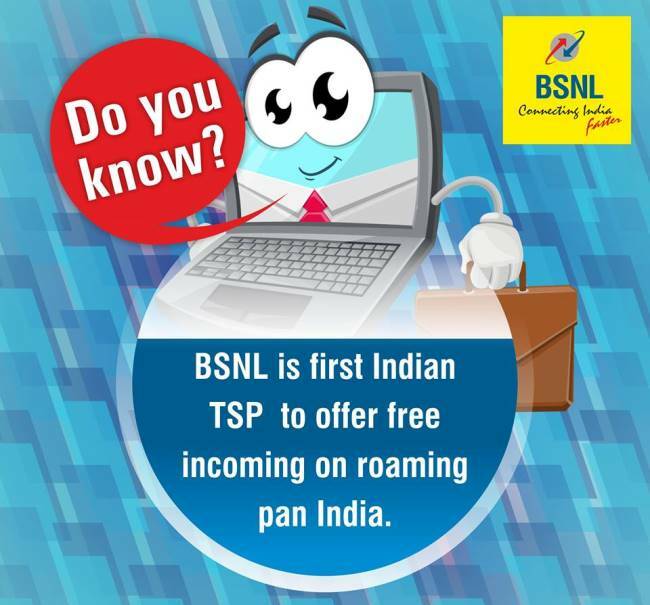 BSNL already offers Free Incoming Calls in Roaming and it is surely a welcome step to attract more customers. Apart from BSNL, almost all operators like Idea, Airtel & Vodafone also offer Free Incoming Calls in Roaming but Outgoing Calls are charged as per the standard roaming charges. Airtel had in fact started testing Roam Like Home Packs where Airtel users would be able to make calls at home circle rates in Roaming as well. You can check the exact price in your circle on this page. What is the Offer BSNL Calls, Combo, Voice STV to work in Roaming. How to activate it? It will be automatically activated on your BSNL number starting 15th August, 2017. What are the Charges? There are no charges for it, it is a Free Upgrade to all customers. Can I use Special Packs in Roaming like BSNL Sixer Plan etc Yes, You can now use these packs in Roaming now.